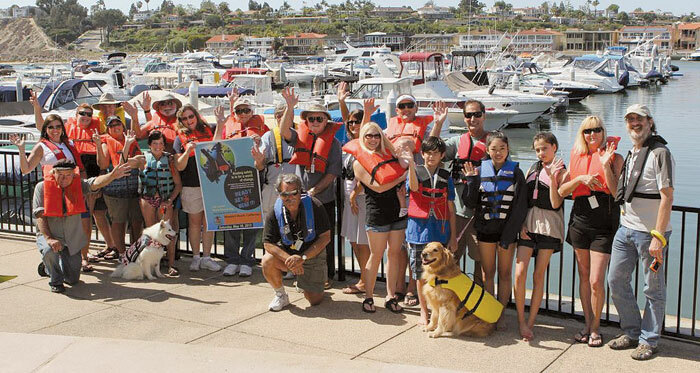 NEWPORT BEACH — In an attempt to help set a world record for the most life jackets worn at one time, the Balboa Sail & Power Squadron organized various “Ready, Set, Wear It” events throughout the city May 18. Boat owners, watersports participants, Sea Scouts and others participated in the one-day event, which was part of the National Safe Boating Council’s annual campaign to promote safe and responsible boating. “Our concept was to work with each stakeholder group to organize these events to be held at each location as part of our squadron’s mission to promote boating safety and boater education,” said Dave Stancil, safety officer of Balboa Sail and Power Squadron. “We are delighted that these organizations reinforced their members’ commitment to safe boating and safety in Newport Harbor,” he added. A total of 73 participants from Orange Coast College School of Sailing and Seamanship, American Legion Yacht Club, the Newport Sea Base, Newport Dunes Resort and Balboa Sail and Power Squadron donned inflatable life jackets at the coordinated events. “Ready, Set, Wear It” events were held throughout the U.S. and Canada as part of National Safe Boating Week. In 2013, there were 3,993 participants. Nationwide results for the 2013 efforts will be announced later this month.